The Asparagus Kid safari'd from Accra to Lome to sell Bertie W00ster asparagus but Bertie was unavoidably detained by the dastardly Mr G0mer and never turned up. Now the Lad wasn't a happy camper and today started cursing Mr G0mer in chat, and he just won't let go. 5:21 PM HENS: Guy u took all the information that you collected from me, as Mr Zhorick to Scam right? He also thinks Mr G0mer has stolen his scamming format and is using it to steal his jobs. I can't imagine how he got that idea. Most Lads, I find, are only good for one safari, but the Asparagus Kid is begging for more pain, so Mr G0mer sent him this message. 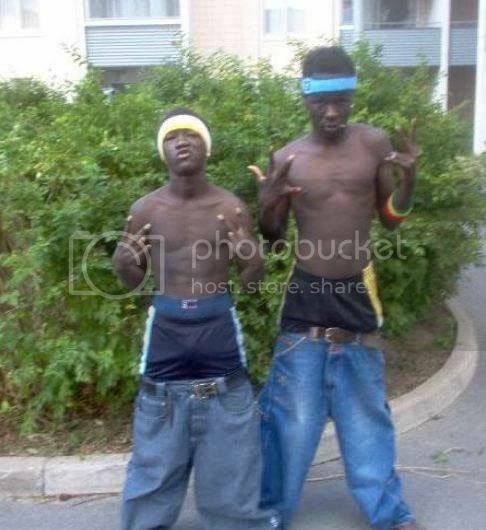 I just had to use that photo in a bait - a couple of Nigerian gang bangers who think lowering your pants is cool and finishing with the Three Musketeers motto just seemed so right. Shouldn't Abbott and Costello be showing the same signs ? That's how we know they're G0merBoyz. Onward to another safari, Gomer. Hilarious! He's rumbled me - sort of. He sent this chart to Bertie W00ster so he must suspect that he was duped all along, but by another Lad but let's still try running with fairy story #1 for as long as I can, though I have a fall back fairy story #2 if that fails. This is my way of saying 'explain what you think is going on to me' and if I think it's funny, I'll run with it. I'm only half busted. He still thinks I'm a Lad, so that gives me wriggle room. He sent this chat to Bertie's mailbox. Getting duped has clearly irked him and he's drawn like a moth to the flame. Music to mine ears, if it were only true! Mr Gomer must get all the clients himself! !